Largest Of Calif. Wildfires Destroys 10 Homes, Other Structures : The Two-Way More than 5,500 firefighters are battling the so-called King Fire in the Sierra Nevada forest area. Some 2,800 people have been evacuated. 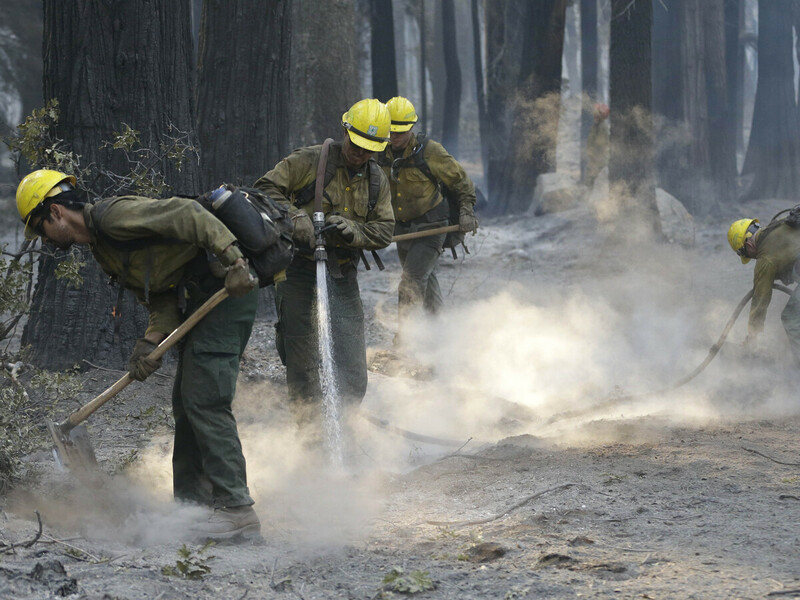 Firefighters from the U.S. Forest Service clean up hot spots of the King fire in the El Dorado National Forest near Georgetown, Calif., late last week. The so-called King Fire, one of several sweeping through parts of California, has destroyed 10 homes and 22 other buildings, fire officials say. Sacramento's Capital Public Radio reports that more than 5,500 firefighters are battling the blaze. CPR says: "A dense smoke advisory is in effect for the central Sierra and in the Reno area due to the King Fire. Several schools in Colfax and Foresthill have closed today due to the smoke." "So far no residents have been hurt, said fire service spokesman Tom Piranio, but 2,800 people had been evacuated. Firefighters had only recently able to enter burned areas to report on the damage, he added. "Rain and lower temperatures have helped firefighters make some progress against the blaze which began on Sept. 13, [CalFire said]." "The fast-moving blaze located about 60 miles east of Sacramento that started Sept. 13 grew to more than 128 square miles Saturday despite periods of rain overnight. A man charged with starting the fire, Wayne Allen Huntsman, 37, pleaded not guilty to arson Friday and remains in the El Dorado County jail on $10 million bail. "More than 21,000 structures remain threatened as the blaze remains at 10 percent contained. More than 5,000 firefighters — from as far as Florida and Alaska — are helping California crews battle the blaze that has not only consumed grass and brush, but swaths of extremely dry tall timber."